Much rubbish is talked in some locations about how the reference period for anomaly plots is chosen to to create worse temperature rises than reality. 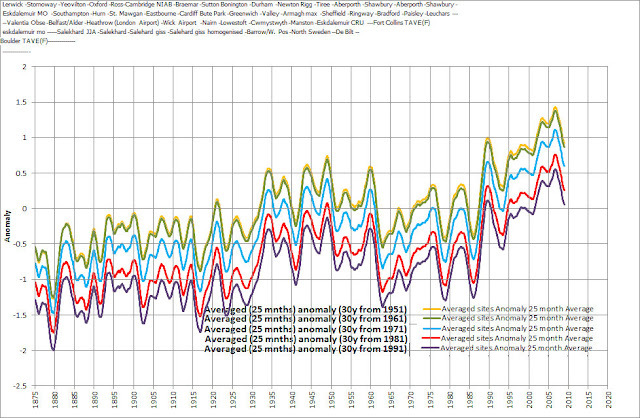 Here is a plot showing monthly data from UK station temperatures. These are converted into anomalies by taking 30 Januarys from the start year, averaging the temperature and then subtracting this from each January to create an anomaly. This is repeated for each month to create the full plot. This method shows how met. stations are warming and allows a reasonable average anomaly to be calculated over dissimilar (envirnonmentally) stations. It also removes the annual fluctuation in temperature reducing the need to filter this out. The plot shows 5 different start years from 1951 to 1991 (the latter only having 20 years averaged for the anomaly calculation. As can be seen all that happens is the plot gets shifted up and down the chart. The wiggles and the slope are constant. NO ADDITIONAL WARMING is created by changing the reference period. The reference period is not relevant unless the distribution of temperatures throughout the year changes. Plots are in latest post. I cannot post on WUWT (banned) so I will leave this in your hands.